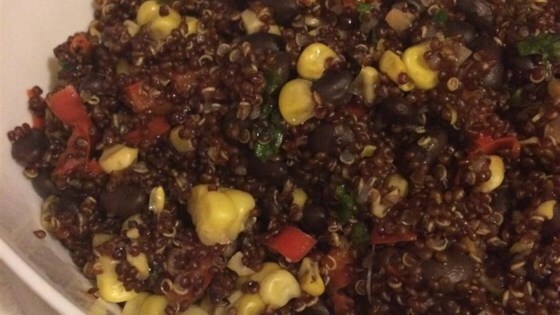 "Incredibly tasty dish that even non-quinoa lovers will love! Add other veggies and peppers to taste. This can be served either hot or cold." Heat oil in a saucepan over medium heat. Cook and stir onion and garlic in hot oil until lightly browned, 5 to 7 minutes; add chopped red pepper and continue to cook and stir until slightly tender, 1 to 2 minutes. Stir quinoa with the onion mixture. Pour vegetable broth into the saucepan; season with chipotle pepper powder and cayenne pepper. Bring the broth to a boil. Cover the saucepan, reduce heat to low, and simmer until the quinoa is tender, about 20 minutes. Stir black beans and corn into the quinoa mixture; simmer until the beans and corn are heated through, about 5 minutes more. Use habanero-infused oil if you have it, but any other hot pepper infusion will suffice. This is one of my most favorite side dishes of all times and one of my guests' favorites. You can eat it warm or cold.